If you ask an American to name a donut and coffee shop, the majority will say Dunkin’ Donuts. You may also hear the name Krispy Kreme and maybe a few other small chains. If you put the same question to a Canadian, you’ll hear one name every single time, and that name is Tim Hortons. This is the biggest quick-service chain in Canada, with more than 4,400 chains around the world. This chain’s reach has actually extended into the US, but it’s still lagging behind many of its competitors there. In Canada, it’s not behind anyone and it is a brand that millions of Canadians rely on to get through the day. So, what makes this brand so popular? Well, for one thing, the Tim Hortons secret menu is a thing of beauty. This might not be the most well known chain in the US. It might be someway behind the likes of Dairy Queen and Starbucks in terms of US locations and popularity. But it has a secret menu that can rival both of those, and there is also an extensive standard menu to enjoy as well. Tim Hortons are the coffee and donut kings of the north, and it’s a title they will likely be holding onto for many years to come. The first Tim Hortons location opened in Hamilton, Ontario, in 1964. It went by the name Tim Horton’s Donuts and was founded by a former ice hockey star of the same name. Horton partnered with a man name Ron Joyce and things were going well for the pair. They branched out into other locations and were turning a healthy profit. But things took an unfortunate turn for the partners and their business when Tim died in an auto crash in 1974. At that point, Joyce became the sole owner of a chain that claimed several dozen stores. He looked to expand the brand further from there, and he succeeded in doing just that. The expansion was aggressive and the brand exploded at an unprecedented rate. They shook-up the quick-service industry and made life very difficult for independent donut shops and coffee shops. But in the process, they made it easier and cheaper for customers to get the product they sought, while also guaranteeing them consistent quality across the board. The brand was later picked up by Wendy’s, only for them to sell off off the brand as it continued to grow. 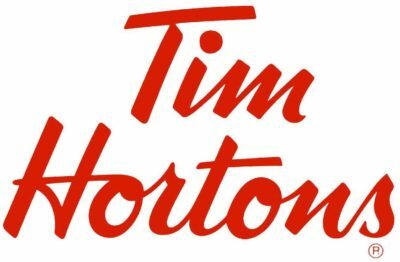 In the early 2000s, Tim Hortons took over McDonalds as the largest quick-service chain in the country and was later acquired in a merger by the same company behind the Burger King brand. The Tim Hortons menu is huge, and it’s not just donuts and coffee. In the early days, Tim Hortons sold only donuts and coffee. This is how the brand got its name and this is how they made their profits early on. As the chain grew and as consumer needs grew with them, they began offering more baked goods. These days you can purchase all kinds of treats and drinks, including bagels, tea, hot chocolate, hand-made sandwiches, smoothies, paninies, wraps and more. Tim Hortons actually has one of the largest menus of any coffee and donut chain. However, the types of donuts you can order are not as varied as they are at DD or KK. Some of the most popular treats that set the Tim Hortons brand apart include doughnut holes, which are essentially small doughnuts; cookies, which are freshly baked and come in a variety of flavors; and danishes. Many stores also sell croissants, a menu item that just isn’t available in many competing chains. A gooey, sweet cookie topped with white chocolate treats. Just one of many dessert items from the Tim Hortons bakery menu. It’s big, it’s fun and there are items that will surprise even the most dedicated Tim Hortons customer. That’s what a great secret menu should be about, and that’s a mold that the Tim Hortons secret menu fits to a tee. As big as it is, it’s still being added to all of the time. We’re always looking for new items and we’re always discovering new secret menu hacks. But if you know of a menu hack that you can’t see on our Tim Hortons secret menu, then please drop us a line and we’ll see if we can add it to the list. A freshly baked muffin from Tim Hortons. It will come as no surprise to learn that donuts are very fattening. They are basically balls of fat coated in sugar. However, there are lighter options on the menu. Tim Hortons actually has a menu section for “Lighter Items Under 300 Calories”, which tells you all that you need to know. These options include Greek Yoghurt and Homestyle Oatmeal. These are great as snacks and as breakfast dishes, but they won’t fill you up at lunch. Fortunately, there are also plenty of other healthier options available. Their Classic Bagels are fairly light, with minimal amounts of sugar and sodium; and you can also order a hot breakfast that is fairly low in calories. There are also plenty of options for vegans, vegetarians and those on a gluten-free diet. The same applies if you have certain food allergies. All information for these special diets is displayed on the menu, and if you’re not sure, you can just ask. To learn more about Tim Hortons calories, fat and sugar, but sure to read our Tim Hortons Nutrition Info page. This is updated regularly and contains all current menu items, as well as the nutrient information. A selection of tasty donuts from Tim Hortons that anyone will find hard to resist. Make no mistake about it, Tim Hortons offers cheap, fast and delicious food. The brand has been able to grow so quickly because everything is so cheap. That’s not to say that it’s low quality. Far from it. The beauty of baked goods and big brands is that the produce needed to bake them can be stored for a long time (it’s mostly, flour, sugar and fat after all) and is therefore not as perishable as other stock. So, they can bake as much as will be needed for that day, sell for a profit and then reap the rewards. The prices are low, but the mark-up is still high enough for them to profit. As a result, everyone is happy. You will pay more for certain items though, including grilled sandwiches and other hot snacks. If you’re on a budget, this is not the cheapest place to buy menu items like that. However, it’s far from the most expensive either and you can still fill a substantial hole with a hot breakfast for less than $10. A handmade sandwich will set you back between $6 and $7; a smoothie costs a few dollars; and their bakery fresh donuts are less than $1 each, and even cheaper when bought in boxes. To see more Tim Hortons menu prices, check our full menu page. Tim Hortons has enjoyed exponential growth over the years, especially in the last couple of decades. The vast majority of its stores are in Canada, where there are new locations being opened all of the time. It took close to 15 years for them to reach the milestone of 100 stores and a further 6 years before they hit 200. But things progressed rapidly from there. In 1991, they opened their 500th store in Quebec. This marked the culmination of nearly 3 decades of growth and it was a big time for the brand. But there were bigger years ahead. Within 4 years, they had hit 1,000 stores and by 1997 they had 1,500. In 2006, just under a decade later, that figure had doubled. However, while many locations were still in Canada, they opened their 3,000th store in New York. In 2008, the total stores in the US reached 500, and then they began their expansion outside of North America. Tim Hortons hit the Middle-East in 2012 and by 2016 they had locations in most Middle-Eastern countries. Towards the end of 2016 they also announced that they would be expanding into the United Kingdom. This is a market that has been very hit and miss for North American brands. Taco Bell has struggled there, but many others, including Five Guys, seem to be performing well. Of course, it means that Tim Hortons will be facing competition from both Starbucks and Costa Coffee. In the same month they also announced that they would be expanding into the Philippines. An eclair oozing with cream. Just one of the many baked treats available on the Tim Hortons menu. Tim Hortons store hours differ depending on the location and the country. In most cases, they open a good few hours before lunch, catering for the breakfast rush and the lunch-time rush. This is when they do most of their business, as is usually the case with coffee and donut shops. They remain open for most of the day, but some locations shut late in the afternoon and others shut in the early evening. There are Tim Hortons locations in shopping malls, which may be forced to adhere to the opening and closing times of the mall; there are locations on military bases, which may adhere to stricter hours; and there are also many high street locations that are usually shut by 5:00pm. Check with your local store to determine when it opens and when it shuts. You can do this online, or you can simply give them a phone call. You may have to start on minimum wage, but things can only get better from there. And you get to eat free donuts, which is always a plus. With so many Tim Hortons chains, there are plenty of job opportunities if you want to spend your day giving bleary-eyed caffeine addicts their fix. And why wouldn’t you? This may not sound like the most exciting job to begin with, but big chains like this always hire from within. If you want to be a supervisor or even a manager at one of their restaurants, then you need to work your way up. They do this because they want to hire people who are familiar with their brand. They want people who know the chain inside out. This is why managers are always the best ones to consult for secret menu items. It’s why they always seem to know every item, every hack and everything there is to know about the chain. So, if you want to make it to that position, then be sure to drop in, check if there are any vacancies and then be prepared to start from the bottom. You can find details of available jobs on the Tim Hortons website, on local classifieds and on online job sites.